Exercise is good for health. However, elite athletes seem to be prone to illness during periods of heavy training. Elite athletes are not immune deficient, but intensive training could lead to immune system depression. Most athletes self-report being sick with upper respiratory systems (RPS). However, these symptoms are not always confirmed with a physician and the difference between inflammation and infection are difficult to assess without lab procedures. A reduction in infection resistance may be the results of a weakened immune system, not only by affecting cell-mediating immunity and inflammation but the innate immune functions. 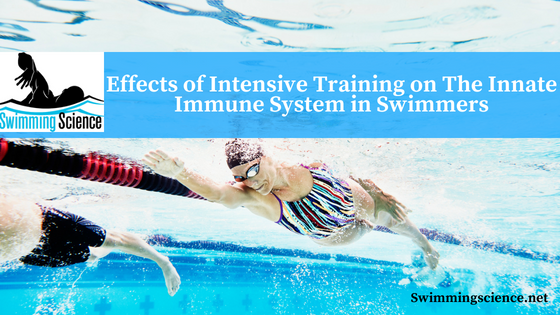 The purpose of this study was to measure the effects of intensive and prolonged periods of training on the innate immune system. Eighteen Junior and Senior of Portuguese national level and a group of non-athletes were assessed. The swimmers spent a mean of 16 hours a week swimming and 2 hours in dry-land. The athletes recorded their workouts, including volume and intensity for a 29-week period (winter season). The swimmers recorded any URS, but this was not confirmed with a physician. The immune function was assessed four times throughout the winter season via blood samples. Long-term intensive training may affect the capacity of immune cells (monocytes, dendritic cells (DC), neutrophils) to produce inflammatory cytokines. This may compromise the immune system and increase the incidence of URS. In conclusion, our results point to a reduced ability of monocytes, neutrophils, and DCs subsets to produce cytokines caused by prolonged hard training. Since these molecules are usually required to initiate and modulate immune responses, our findings could also contribute to explain, at least to a certain extent, the increased number of URS episodes developed by elite athletes, during and after periods of hard training. These results support the idea of an intensity-dependent long-term effect of exercise on innate immune cells. During periods of intensive training, higher rates of URS are expected potentially secondary to an increase in inflammatory markers. This may suggest the use of natural anti-inflammatory foods, high in omega-3 fatty acids. Morgado JM, Rama L, Silva I, de Jesus Inácio M, Henriques A, Laranjeira P, Pedreiro S, Rosado F, Alves F, Gleeson M, Pais ML, Paiva A, Teixeira AM. Cytokine production by monocytes, neutrophils, and dendritic cells is hampered by long-term intensive training in elite swimmers. Eur J Appl Physiol. 2012 Feb;112(2):471-82. Study appears to be helpful in planning Hard Intensive Training. But we must study/analyze complete data and findings. It can only be applied where complete lab facilities are available. How we neutralize cytokine producing effect?